We’ve had a good week here at CSE. Our push for client stability has paid off greatly, culminating in the successful testing of over 1500 Bots using abilities, which stressed both our item and particle systems, all with great performance! It’s a big win for us and our Backers as this is one of our big requirements to for Beta 1. 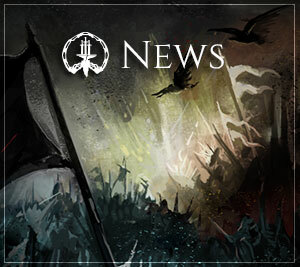 Next week we’ll continue tracking down the currently remaining asserts and continue on the road to Beta 1. 1. WIP – Tech – Client Stability and Bots: After finishing the “scene lock” changes last week, we’ve been able to find other asserts (a warning that something is wrong) and bugs that were previously hiding behind the scene lock asserts. This week, we’ve fixed a few issues with the world state on different proxies not lining up, Andrew has dug into the impostor code, fixed asserts, or the potential for asserts, and the entire engineering team has supported the push for improved client stability. To help us do this, we’ve had an army of over 1500 Bots assisting us! Which leads us into our second item. 2. Tech – Bots: We’ve had over 1500 Bots running around, using abilities, and firing effects-laden projectiles at one another! This is more impressive than the last time we had 1500 Bots in a small area, as now Bots are now all individual player clients, use both melee and ranged abilities, use items such as arrows, and are stress testing our recent VFX improvements! And we’re still at a great framerate that we will continue to improve. Overall, the past three weeks have had a solid team effort to improve our code, and hence overall client stability and performance! 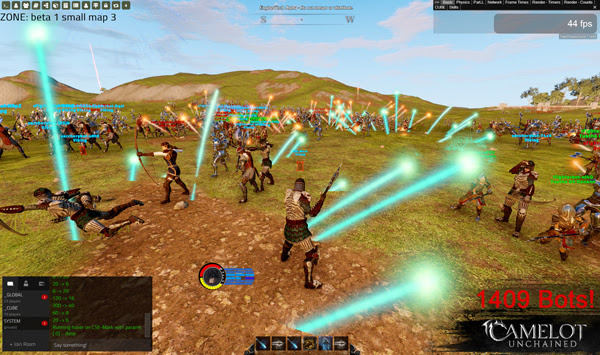 Last night, we hit 2.1K Bots, comprised of 360 archers, about 1800 fighters, and at peak over 200K particle effects a second. Until we hit about 1800 Bots (in a small area, as usual), the game was quite playable on Mark’s rig. 3. WIP – Tech – Zone Portals: Currently in code review, Colin has been working on a couple of important features for zone portals. First, he created the tech needed to enable portals only when their destination islands are online. Second, the tech needed to represent this with their VFX state. This tech will be particularly important during Beta 1, when we need players on specific islands/zones for different types of testing. 4. WIP – Tech – Placing Items on Buildings: In order to get the epic siege warfare we want, we need to be able to place siege engines in all areas of a building, including the upper levels. Items like siege engines and Voxen currently snap to terrain when placed. Matt’s work will allow us to line siege engines along the walls of buildings so you can rain pointy death upon your foes! 5. WIP – Tech – Random Crafting Events: Christina has built in support for random crafting events when using the Vox. We now have a table we can reference during the crafting process to create a chance of boosting a particular stat of the resulting item based on variables we set. For example: Say we’re making a weapon. Designers can set different weights to produce different results. A weight of 10 on the piercing damage stat (along with tweaking some other values) would mean that 10% of the time, the job grants a certain percentage bonus to piercing damage. We could also do things like lower stamina cost by a few values 40% of the time. The system is extremely flexible and allows for even more variety in the items players craft. 6. WIP – Tech – Inventory UI: AJ dropped the new UI in-game and is now tackling improvements on the performance, particularly with loading the paper doll and the search responsiveness. It’s important that our UIs, even early in development, are snappy and responsive. 7. WIP – Audio/Tech – Inventory Item Material Tags: Completed this week from Christina: We now have the ability to use tags on equipment, so that sounds, such as footsteps, can change based on the materials of the gear you are wearing. The next step is more work around alloys and materials, which will allow dB to begin using this tech. 8. WIP – Art – Mine Environment: We’ve gone a little mine crazy. Knowing we wanted to have lots of pieces to work with, and something interesting for Backers to try out, we’ve added more segments into the first-pass mine for testing. This means we’ll probably be wrapping up next week for initial testing. 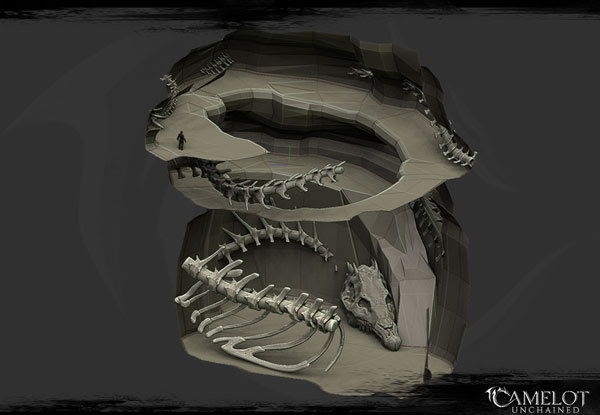 This will also include a new creature fossil model from Jon, as well as the previously mentioned Depths-inspired shrine. Jon is finishing both of those up today. 9. WIP – Art – Scorpion Animations: With Ben’s assistance, Jon updated the existing Scorpion model to better support more realistic loading and firing mechanisms. Scott then rigged and completed a rough pass of a short firing animation for Beta 1 testing. Additionally, Scott also roughed out a longer, full loop animation with all the different steps required to load and fire the engine. These rough assets are then handed off to Matt, so he can work on syncing player animations to the Scorpion. 10. WIP – Art – One-handed Sword: Sandra has moved on to two different death animations to support various one-handed weapon combinations. The first one will be polished for the dual wield of a mace/club and sword, the latter for a future combo such as shield and spear. Scott has completed the dual wield jumps and locomotion assets for the sword and mace. All of these should make it into the game next week, followed by mace and sword in the opposite hands, then shields, daggers, and spears. 11. WIP – Art – More Environment Assets: This will be a WIP all the way up to Beta 1 as Tyler finds time to add in new assets. He’s currently focused on re-organizing the assets we have, so it’s easier to build out the world. This includes finding the gaps in our assets to support visual changes in the world based on Realm control, as well as producing a visual library for Michelle to art direct. This large photoshop file will allow Michelle to visually compare the assets and suggest different combinations of existing assets. 12. 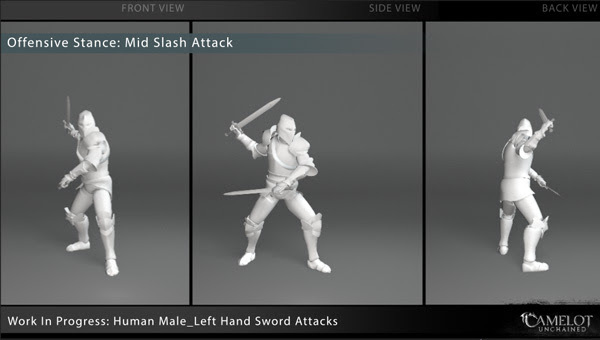 WIP – Art – VFX and SFX: After finishing the healer archetypes last week, Ben has started work on the melee archetype ability component breakdown. This will then be used by Mike and dB to add VFX and sounds, respectively. This will be done in phases, starting with generic assets and moving up to specific assets per component. dB is currently re-adding generic sounds to the bow components, which will be followed by more specific component versions next week. Mike continues to work through the long list of particle needs, focusing this week on several new prototypes. 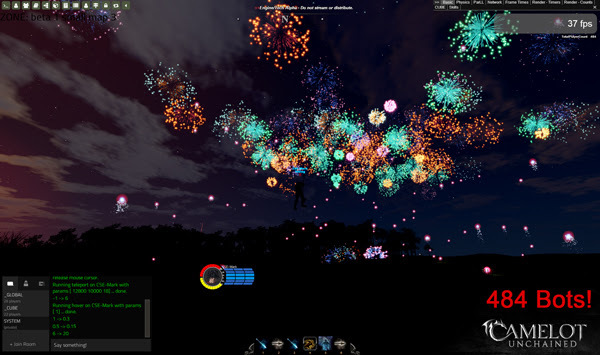 Additionally, he’s been tuning our firework particles for continued performance testing. 13. Art – Concept: Michelle finished concept art for the Tuatha and Arthurian Realm portals when influenced by terrain ownership. Jon will then begin work on the TDD model, followed by material passes on both models. 14. Art – Icons: James finished several more player inventory icons this week for various weapons or armor that we passed over during the first pass. These will be added to AJ’s new character inventory UI. So yeah, a lot of progress this week despite a great deal of focus on client stability, which took time from many engineers on the team. However, that time is certainly not wasted, as we’ve shored up not only a number of smaller asserts, but the potential for future issues, by cleaning up the scene lock code. At the end of last week, we were still in the midst of that cleanup–much more heavily than this week. Our testing at that time supported 400 Bots, which by today’s standards is definitely a big number. But this week, we’ve returned to successfully testing over 1500 Bots! Sorry, can’t help but reiterate how the rewards of these efforts are blossoming. The performance is great, and we look forward, just as you do, to those big battles we’re focusing on. Alright, let’s move onto the art highlights for the week. As mentioned above, Sandra and Scott have both been working on one-handed weapon animations. Click the image below to see some of last week’s work from Sandra! 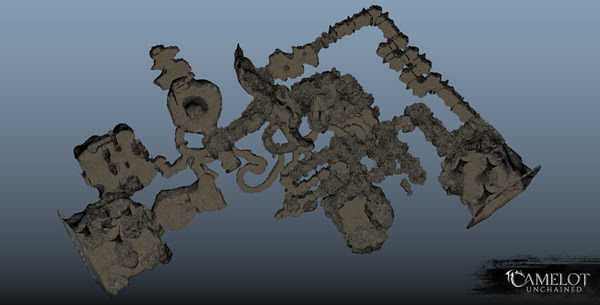 Next up, we have a good view of the mine work Dionne has been doing, this time an overhead shot in Maya of what will soon be updated in-game. 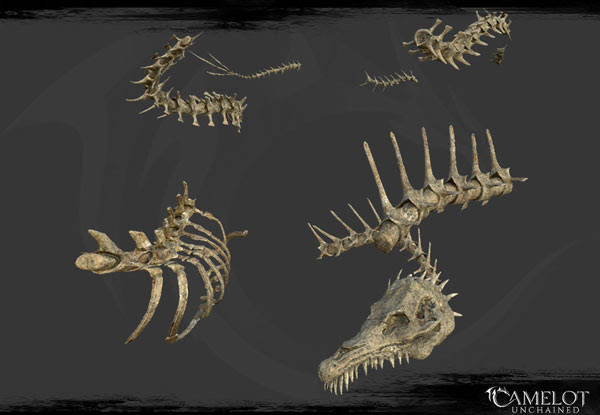 As mentioned in the Top Tenish, Jon has been working on a fossil piece for one of the rooms. And here’s the placement of these old bones in one of the mine’s rooms. 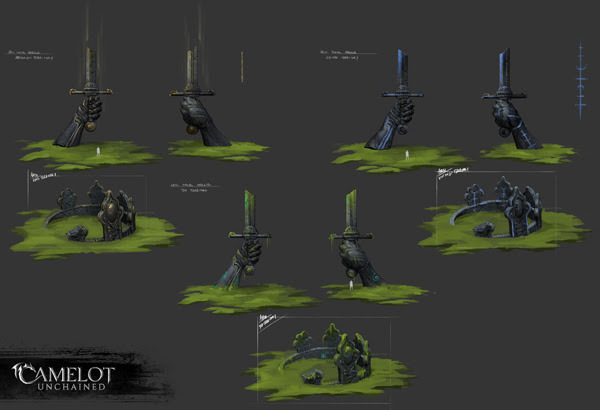 Next up, we have the concept art from Michelle of the Arthurian (first), then the TDD (second) portal markers with their Realm control variations. 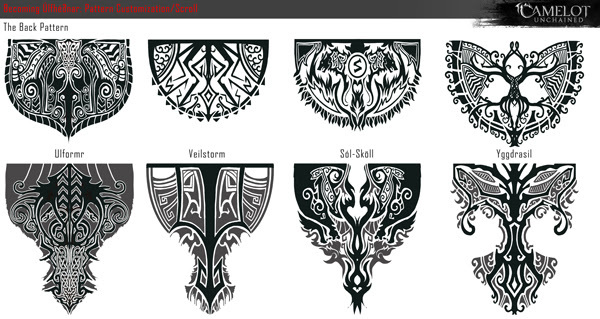 For a bit of a tease, we have some designs for one of our Viking races, the Úlfhéðnar. 2) These screenshots were taken on Hatchery. That machine and build is not as optimized as a Fledgling build. That will come next week. That’s one of the reasons tonight’s Alpha test didn’t start until nearly 11PM Eastern Time. We were in the office trying to get the Bots working on Fledgling too. That should happen next week. 3) At peak, our engine was handling about 200K particles per second quite well. We expect to do even better than that over the next couple of months. 4) The first shot is at night because it looks so much cooler. The last two shots are of me moving through the Bots. 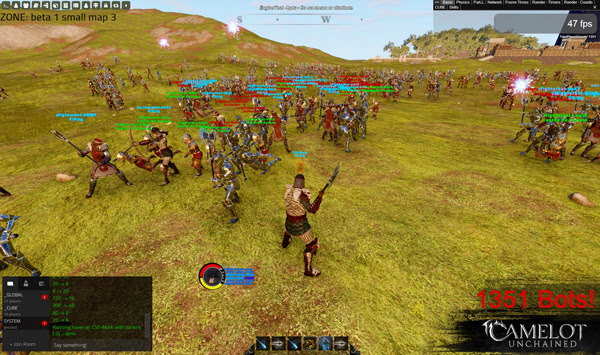 BTW, can you think of another game where you can run through a crowd of 1409 players at 44 FPS? In terms of Alpha Testing, Fledgling is now open for all of our Alpha and IT testers this weekend so they should expect a separate email from us shortly! All said, another solid week of work in the can from the team at CSE. We hope you’ve enjoyed the journey so far, and are excited to see the weekly rewards of our collective efforts. We’re happy to show them to you! This week will feature a Big Bot Battle test and hopefully, a Beta test over next weekend! As I said in our livestream, because we were able to support 1K players with VFX, we can now officially say that we have met one of the Kickstarter milestones as well as one of the major milestones for Beta 1. Up next, we expect will be me telling you folks that our VFX system is also Beta 1 ready. Stay tuned!